A RARE, fully brilliant example of a Double Die Reverse 1951 Franklin! 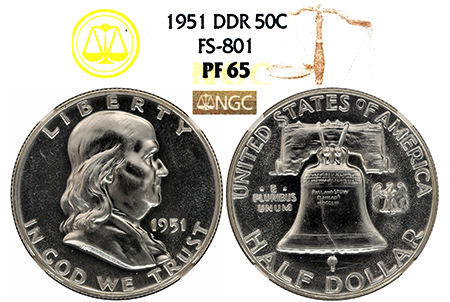 This example features occasional shallow features on both the obverse and reverse due to the doubling on the Liberty Bell. Die doubling often results in a weaker strike, thus weaker features. This example sports jet-black, fully brilliant surfaces with zero haze, toning, or spots. With just 5 graded PF 65 and only 30 TOTAL graded by NGC, this example features phenomenal surfaces as an early-date, rare DDR Franklin!